Turtle Moon Studios. Susan Shie. Turtle Trax 5-8-00. Our lilacs have been in bloom for a week! Ahhhh! First of all, greetings from totally green and beautiful Ohio, when it's starting to be planting time! Wow! How I love to garden, and especially BEFORE the mosquitoes get going here! Since the tiller is broken, this year we're doing things differently. I've got 360 Jiffy peat pots sitting in plastic baby greenhouses in a spare bedroom, waiting to germinate. Then, when the shoots are up, we're sticking them in the cold frame, which Jimmy and Floyd built. I used to have a neighbor who did cold frames every year, and Charlie Hodge's garden just couldn't be beat! We can have a killing frost here until the end of May, so you gotta be really sly about protecting your plants til then! And my darling pal Robin Schwalb arrives today, to help us stick those peat pots in the ground, in case they're ready this week! Otherwise, we'll busy ourselves weeding the many flower beds! Robin gets out here from NYC about once a year or two, and tries to make it at planting time, since she can't plant a garden on the 11th floor of her co-op building. Poor thing! She and I are also going to babysit Omari on Wednesday, so Aimee can go do her nurse's training interview. Robin, Marykay Yannotti, who's arriving Friday, and I are going to help Aimee and Omari move, too. Then we'll go up to Oberlin, for the FAVA show opening! The bad news is that this month's diary is cut short for now, because my darling Waltzing Matilda, my Mama Mac, is highly sick and feebly! She does a total crash, in which I can't open the hard drive or even start her up, after I do anything involving fancy programs. I got the pix below all onto the server, and then the fussy thing gave me a piece of her mind! So the rest of the adventures, like the Great Family Easter Party, our classes at Sugarcreek, and the wonderful Lake Tahoe gig with Leslie Gelber, will have to wait until I get Darrell the computer whiz over here! May be another month, but let us pray for mercy and hope it's sooner! 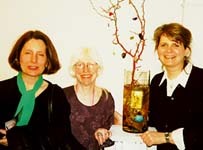 This is a photo of Jeanne Weinberg (woman on right), Suzanne Fisher, and me, at Jeanne's thesis show exhibition in Columbus, March 4. I was Jeanne's committee head and prof for the last three years, doing her Antioch University Independent Master of Arts degree, and Suzanne was her other main prof. 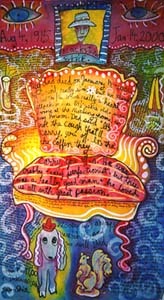 Here Jeanne shows us her final piece for the show, with a title something like "St. Jeanne's Passion." That's not right, but she kept changing its title, partly because she wasn't going to include it in her show. It hadn't cooperated with her, when she poured resin down over all the objects in this glass cylinder. In fact, it had heated up so much, she thought she might burn the house down. The improperly mixed resin partly melted things in it, and turned a beautiful amber color, which to me looked like creek water. We won't say what Jeanne thought it looked like! Anyhow, a bunch of us convinced her that the results of her bad chemistry were totally wonderful, and we got her to include it! The thesis was called "A Walk in the Dark," and had to do with her examination of painful childhood memories. She felt the most exultation, during this sensitive quest, when she visited the Vietnam Veterans' Art Museum in Chicago, where she felt total empathy with the work made by men with emotional trauma. Jeanne's thesis show was honest, moving, and powerful. And it was healing for her to go through that scary search and make art out of the energy. Wow! OK, so this is what you all came back for, right? Here is Aimee, holding Omari just minutes after he was born - his first photograph after being hatched on March 7, at 6:30 pm. I had just put up the last diary, when she went into labor! We arrived at the hospital at around 2 pm. Aimee's sister Julie and I were the birth helpers, along with a wonderful midwife named Linda Mast. Also, a friend Brandy came later, as soon as she could get permission to leave work at the Co-op, and my brother Jim, who's Aimee's dad, came a bit later. He happily ran the video camera, during the most dramatic part of Aimee's labor. 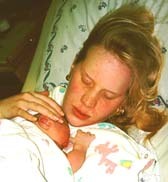 Aimee did natural childbirth, working very hard to keep ahead of the pain. I sure remember that, from Gretchen's Lamaze birth, 29 years ago! The midwife was just great, and we got to stay in the same room for delivery, so it was like a home birth, in many ways. It ended up with Aimee delivering on her side, which was a new one to all of us, but that's how Omari was choosing to come out the easiest! He was almost 8 pounds! Isn't he a doll? Isn't she, too? And she worked it out perfectly, so that Jimmy and I would be home when she had Omari! How considerate! And here they are, five weeks later! Omari is sporting the custom made baby tee shirt Leslie Gelber had made for him, with the moon from the more complicated drawing I had made, which is on the conference's tee shirt. By this time tho, our little hero was almost outgrowing it, weighing in at over 10 pounds! You can clearly see that Aimee got back her lovely figure right away, too! Nursing mamas have it made! So, just a few days after Omari stepped into the world, Jimmy and I took off to teach a residency for a month, in Delaware, OH, at Rutherford B. Hayes High School, with Lynda Elias' art classes. It was through the Ohio Arts Council's Artists in Education program. Here are Bret and Marshall, working on murals on canvas, with Jimmy and his airbrushes. The core group of our residency was Lynda's Pro Art class, whose two porjects were these murals with the theme "My Own Private Delaware," and also quilt blocks called "Personal Portrait." Marshall's painting is about a huge downtown fire in the city's history. Another group we worked with was the Whitney-Scotts, the Enrichment classes. Here is half the group, with about six tables pushed together, for a good old quilting bee! Their theme was President Rutherford B. Hayes, who actually grew up in Delaware and attended Ohio Wesleyan University there. Since the school is named after the guy, it seemed appropriate. They came up with lots of interesting research on the man and his wife Lucy. John Scott's laptop helped immensely with all the little stats! Their quilt, when sewn together, will hang in the school. We also worked with the Art Club, gave two slide talks, did a Teacher Inservice, and held workshops at the local art center, as parts of our residency. One slide talk was at the nearest grade school, showing our work to very attentive fifth graders and teachers. 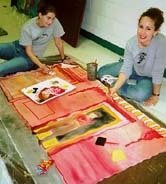 Here are Bethany and Katie, working on their Pro Art mural, based on a photo from Delaware's history. It's the Sanitary Barber Shop!!!! They chose to do a collaboration. All the canvas murals were 72" high by 42" wide.They were airbrushed, as well as brush brushed. Here are some of the loyal Pro Art students, whom we really got to know! From left: Becky, who tried to teach me to do finger weaving; Ben, who was the most helpful person! And who actually took my advice, to put tin strips on the garbage can, on his mural; Jeremy, who was disgusted, because I said I'd keep all the pink flamingos, if his church group put them all over my yard! And who really worked hard at learning to sew; Melissa, who was so hardworking on her two sewn quilt blocks, so intense in her embroidery, and so creative in all ways, as well as very cheerful and sweet to us; and last, but not least, Gary, who now knows to put his wonderfully arty grafitti on canvas murals! He was also very nice to us and worked very hard. It's just great, when high school students, most of whom are busy disassociating from people their parents' age, are willing to truly interact and get something accomplished! Good for you guys!!! Stephanie, also in the Pro Art group, worked tirelessly on her mural of the Delaware pacers in the historic Little Brown Jug national horse race. She worked in the hallway, outside the art room, beside me. 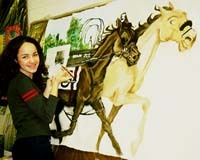 You can't believe the attention her mural making process got, since her horses were so beautiful. The school mascot is the Pacer, and even Jim Peterson, the school principal, wanted to own that mural! Incidentally, Mr. P was also very supportive of our residency, making sure we had whatever we needed for our projects. Lynda and her Ohio Wesleyan student teacher, the other Stephanie, were the best teachers you could ever hope to work with, too! What a fine time we all had! 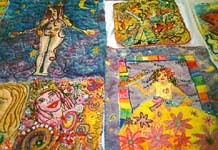 Here are some of the quilted blocks from the Pro Art class. In the three weeks we worked together, and the Spring Break week, in the middle of the residency, these folks got a ton accomplished! You have to be obsessive, carrying your work around with you and sewing at odd moments, squeezing in all the work time you can! And they did. Oh, these are brush painted, before being padded and sewn, so part of the imagery is painted on. We wet the muslin and watered down the regular acrylic paint, so it wouldn't be hard to sew through. Muslin is very soft, so it worked out well. They were using the Lucky School of Quilting techniques: no hoop, and you finish off the edges before sewing the embroidery/quilting stitches. Very portable. You don't get to put on beads until after all the base sewing is done, so you don't end up with loosened beads, after more stitching shrinks the fabric. So they had this incentive: stitch like nobody's business, so you can put on sparkly beads!!! It worked! Here is Lynda Elias, the teacher who wrote the grant for our residency through the Ohio Arts Council, and who was with us the whole time we taught. She's standing in front of her own mural about Delaware, showing The Arts Castle, where we had our little exhibition, after the residency. No one's painting or quiltlet was completely finished, but they all looked great together! I don't have a picture of Stephanie Meyer, our student teacher, but she was very actively involved with us, too! And very helpful! She's now graduating from OWU and joining the Peace Corps! And Lynda's daughter, Sophie Kate, a high school student herself, made a beautiful quiltlet, along with her mother's two of them! Kate and her dad, Richard, both helped us all a lot, too. Richard was the computer whiz, who had a great digital picture show for everyone to see, at the final show! Drug in a huge monitor and set up a computer, just like that! Too bad he doesn't do Macs, and I can't drag him up here to Wooster, to fix mine! Here I am, beginning to brush paint the colors onto my own mural, called "Dad's Chair." I had airbrushed the black parts you see here, and had relinquished the airbrush, so that the students could all work with Jimmy on it. I could have painted in all the colors with the airbrush, if there'd been room for me at the airbrush stations! What I really love to demonstrate to students is how to just start with an idea, and use the airbrush to quickly sketch in a composition, without preplanning it, and then not "correcting" the image, but working with it, as is. You gotta trust the art, how it comes out naturally! And you gotta stick with it and make it work out well! No tracing paper, no erasers! Just enjoy! This is our mural, almost done, tho we added some stquins and stitching to it, and will add more. It's the first art piece I've made about Dad, since he died in January. Its main image is the chair he had in his bedroom at West View Manor, where he lived for the last year and a half of his life. I have that real chair beside me now, as I work. It's not as funky as it looks in the painting, but that's how it turned out. Can't help a thing! You can see Droopy, Dad's little plastic dog, and his stuffed squirrel at the bottom of the painting. I hope to do more unstretched, unprimed canvases soon, again. How I love the speed of making a painting, compared to sewing forever on a quilt. And yet, something compels me to sew so much! Why is that? Some neurosis? Stitchititus? Oh, I used a big kitchen sponge to do the blending of the colors, after wetting the canvas a lot. I found that sponge brushes just weren't able to push into the canvas hard enough, so the kitchen sponge did great. Just have to keep the toxic pigments of any paint off your hands, while you work.